Pour the olive oil in a bowl and add dried mint, dried oregano and seasoning, then add the lamb cutlets and leave to marinate for 30 minutes. In the meantime, place the baby potatoes in a large pan, and cover with cold water and season with salt. Bring to the boil, and simmer for 20 minutes. Remove from the heat, drain and set aside until needed. Bring a second pan of lightly salted water to the boil. Blanch the green beans for 5 minutes in simmering water and remove from the water. Drain and keep aside warm. Over medium heat, heat a large, heavy-based pan without oil. Add the lamb cutlets and fry for 4 - 5 minutes each side until juicy pink, remove from the pan. Add the baby potatoes and the green beans into the pan and fry for a few minutes to coat the potato in the lamb juices. 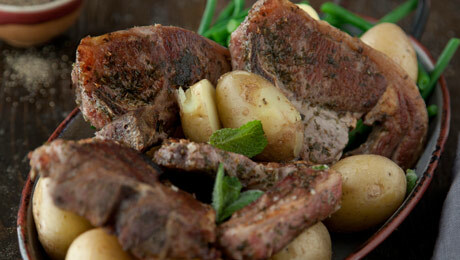 Serve the lamb cutlets with the baby potatoes and green beans sprinkled with the fresh parsley and mint.